The province has some of the highest HIV rates in North America. A man holds used crack pipes in his mouth in Vancouver's Downtown Eastside. REGINA — An AIDS support worker in Saskatchewan says pipes should be more available to drug users if the province wants to reduce HIV rates that are among the highest in North America. Jason Mercredi of AIDS Saskatoon said there aren't any pipes available as a means of harm reduction in Saskatchewan. The province says that is because local organization's assessments have not indicated a need. The pipes can be used to smoke crack cocaine and methamphetamine. Acquiring HIV from a pipe is less likely because the disease has been exposed to air. HIV can live longer in a needle because it's a sealed container. The hope is, if pipes are more available, drug users would use them to get high instead of needles. "The chance of getting HIV or passing on HIV through a meth pipe is very slim," Mercredi said. "The rate drops quite a bit." Saskatchewan has consistently been plagued by high rates of HIV infection. Rates in 2016 — the most recent available data — were more than 10 times the national average in some areas. Nearly 80 per cent of people with HIV in the province are Indigenous. The province currently provides $562,000 annually for drug harm reduction programs to different organizations. Some programs provide needles, syringes, and education support to substance users, while others have naloxone kits and condoms. Saskatchewan doesn't have a safe injection site, although Dr. Denise Werker, the province's deputy chief medical health officer, said there have been discussions about creating them in Saskatoon and Prince Albert. Safe injection stations at the interim injection site in Toronto Public Health's offices. Pipes are being provided in other parts of the country. Kero Sakeub, with the AIDS Committee of Toronto, said safe injection sites in that city often have pipes available. "Pipes are a safer option over snorting and injections," Sakeub said. "Simply because there's no blood involved and it's just saliva and you can't just get HIV from saliva." Sakeub did note that hepatitis is easily transmissible through sharing a pipe. A pipe for methamphetamine use is shown at the People's Harm Reduction Alliance, a needle-exchange program in Seattle, Washington. Maxime Blanchette, a social worker with L'Actuel sexual health clinic in Montreal, said smoking drugs instead of injecting helps people kick their addiction. "They're alive. They're feeling well with using the pipes instead of the needles," Blanchette said. "They're more ready to decrease the consumption." But Shelley Marshall, a public health nurse with the Winnipeg Regional Health Authority, noted that while it is very unlikely to spread HIV, there is no evidence handing out pipes helps with infection rates. "There's no hard evidence that distributing pipes reduces HIV," said Marshall, adding users are more likely to acquire hepatitis from sharing pipes. 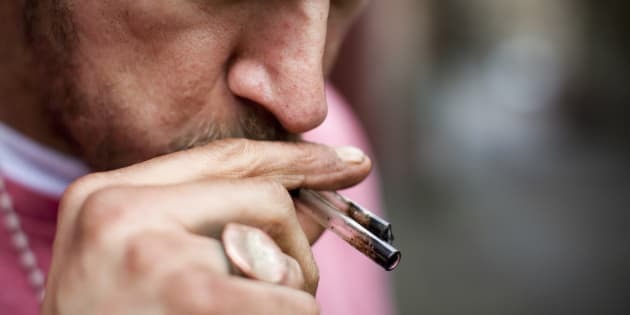 An Australian man smoking crystal meth from a pipe. Werker said providing pipes is something the ministry would consider depending on funding. She added it's only recently there's been in increased interest in the use of crystal meth pipes, specifically. "Certainly there is a recognition that we still need to do more," Werker said. "We are undertaking a jurisdictional scan of harm reduction programs, specifically around the use of pipes, and learning from what other provinces have done." Margaret Poitras, CEO of All Nations Hope, a Regina-based AIDS organization, said having more pipes available in the province would help, but it's not the only solution. "We have to balance out those kinds of solutions with solutions that are getting to the root causes of what we're seeing with Indigenous people," Poitras said. "We need other solutions that are getting to the roots because we don't want to see revolving generation of generation not healing and being well."